Since this summer I’ve been teaching a lot of IELTS preparation courses. As a result, this (and probably some of the upcoming posts) will be focused on teaching IELTS. 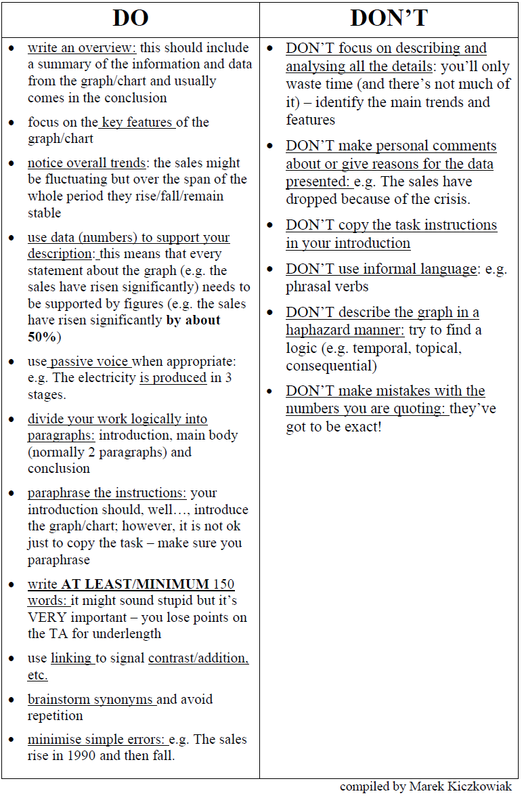 In this one, I would like to share with you a list of tips for IELTS Writing Task 1 that I normally give to my students. Usually the list is a final product of the course during which at different stages we brainstorm various exam tips, and is used as a revision or consolidation. Get the student to write down exam tips on one sheet of paper every time one comes up in the class. At the end of the course this list can be compared to the one suggested here. Alternatively, revise all the tips with the student before the exam to see how much they remembered, and then compare the brainstormed list with the one here. You can also try using the DOs and DONTs at the beginning and then as a reference throughout the course. I hope you find the tips useful. If you would like to add any, please comment below, or Contact me directly. You can sign up for an IELTS preparation course here. Thank you for your advice ,but I have many problems in my reading would you get some advice for reading?recently I could get 7.5 band scor in writing but I am poor in reading what should I do? Thanks for your comment. We’ll definitely post some advice on reading in the future. For now, try to do many exam papers and get accustomed to the format. Notice which questions are the most difficult for you and learn from your mistakes. You can also contact us for IELTS preparation courses. You can follow the blog to get the latest posts by email. Well explained guidelines for IELTS PREPARATION. Thanks so much for all the valuable advice! My students have been struggling with this task and this list has surely helped me adjust my way of preparing them for it. You’re welcome. Glad you found it useful! Hi , Could you explain the last point in the Do’s..
Hi , Thanks for sharing these amazing tips, I definitely going to follow your tips. Actually I am also taking coaching in IELTS and these Do and Don’t tips are amazing. Keep sharing like this.